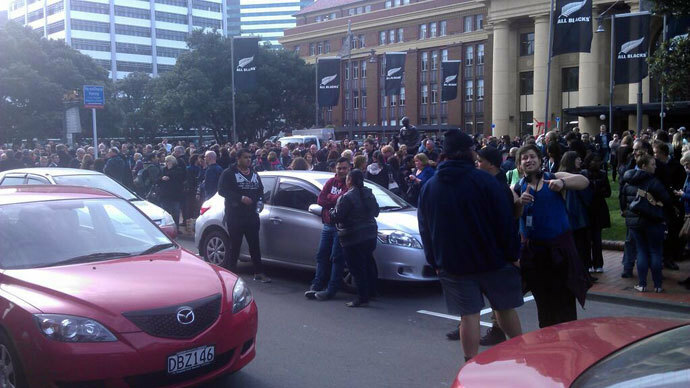 A strong earthquake hit the New Zealand capital, Wellington, with the epicenter some 75 kilometers away. Multiple aftershocks were felt in several cities. People had to leave their homes and train services halted, as evacuation centers were set up. One quake of 6.5 magnitude at a depth of 10km hit the South Island town of Seddon at 02:31 GMT, with multiple aftershocks of slightly lesser magnitudes reported nearby in Blenheim, as well in Wellington. According to local media, additional aftershocks hit the country later Friday afternoon, just hours after the initial quake that rocked Wellington. Chris Birks, the general manager of the Hotel d’Urville in Blenheim, near the quake’s epicenter, told Reuters: "The building just shook and it went on and on and on. There's a lot of police out here and fire sirens going off. It's pretty frightening." Wellington mayor Celia Wade-Brown, however, announced shortly that life was "business as usual" in the capital and people should not be put off coming into the central business district on Saturday. Bill Fry of GNS Science, a New Zealand-based research institute, told Reuters the quake and aftershocks were “very, very frightening and concerning for people, but it's been ‘keep calm and carry on,’" adding that despite Wellington sustaining much heavier damage, the epicenter was actually 75 kilometers south of the capital. There have been reports of boulders coming down on highways and cellular networks down in Wellington. There were also widespread power outages across northern parts of South Island. Local authorities have set up an evacuation center at Seddon School for all residents unable to remain in their homes, amid reports of houses collapsing outside the small town of Ward, New Zealand’s Radio LIVE Newsroom reported. Train services have been suspended as workers check the tracks, but KiwiRail has announced that trains are expected to be running again Saturday morning. No major damage or casualties have been reported, but the tremors were felt everywhere, as evident in this footage from a CCTV camera inside a Wellington store. There was no specific threat of a widespread tsunami, according to the Pacific Tsunami Warning Center. Central New Zealand has in recent weeks experienced a number of earthquakes of varying strength, including a 6.5 magnitude quake approximately 40 kilometers from the current epicenter on July 21. Several earlier quakes, measuring 5.3-5.8 on the Richter scale, were followed by dozens of aftershocks of lesser magnitude. According to the US Geological Survey, the quakes and aftershocks have delineated shallow upper plate structures northeast and southwest of New Zealand, also causing some seismic activity on the north coast of New Zealand’s South Island.